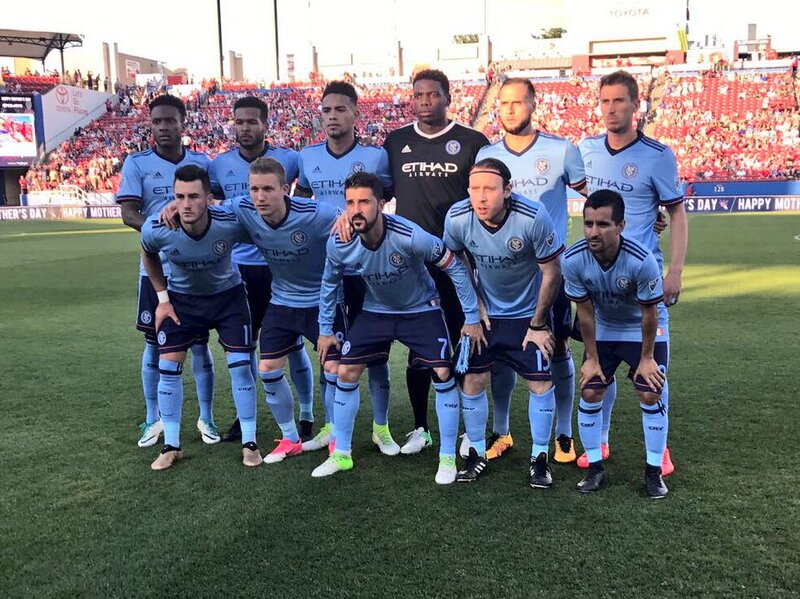 FRISCO – New York City FC kicked off a tough road trip Sunday night with their toughest match of the stretch against FC Dallas. If you were told that NYCFC would come away from Frisco stealing a point off the consensus best team in the league, I think most people would take that in a heartbeat. Such was the case tonight as the Boys in Blue managed to scrape an ugly 1-1 draw off the floor against still-unbeaten FC Dallas. In a move that may have surprised some, Patrick Vieira ultimately decided not to include midfield Designated Player Andrea Pirlo in his squad – a spot that many assumed would revert to the Italian after 19-year-old Manchester City loanee Yangel Herrera left the club for international duty. In the absence of both Pirlo and Herrera, fan-favorite Tommy McNamara assumed the central midfield duties, to mixed results. McNamara was clearly shaking off some rust in the early goings, but City as a whole struggled to maintain possession against the opportunistic FC Dallas midfield. Maxi Moralez in particular seemed to be a target of Oscar Pareja’s gameplan, as nearly every time he touched the ball he was swarmed by two or three Dallas players. That gameplan worked early on, as the combination of Moralez being marked out of the game with Tommy McNamara’s slow start hamstrung any momentum City had moving forward. FC Dallas’ lone goal came off the foot of US International Kellyn Acosta, his third of the year, after some sloppy defensive play at the back. Michael Barrios had the ball up the near touchline, marked by Alexander Callens. Callens got turned around and stumbled a bit, allowing Barrios to thread a ball in at the top of the box that was whiffed on by both Tommy McNamara and Ben Sweat before ricocheting off the foot of Dallas striker Maxi Urruti, setting up the final ball for a streaking Acosta to pound past Sean Johnson in the twentieth minute. What followed was a lot of sloppy midfield play, lots of errant passing and interceptions. Even chasing the game, City couldn’t maintain possession and Dallas pressed for another goal moving into the second half. It wasn’t until the sixty-eighth minute that a free kick drawn by David Villa from about twenty yards would draw City level. Villa lined up the shot that painfully ricocheted off the crossbar, before being slammed home by none other than Tommy McNamara – his second of the season. The remaining twenty minutes were a little different from the first seventy in that the goal seemed to energize City as they pressed for a winner. Mikey Lopez saw his first minutes for the club this season in front of his hometown friends and family. Miguel Camargo also saw some minutes, coming in for McNamara. Interestingly, Vieira didn’t utilize a third sub in a 1-1 match with another to play in just three days. Those left at home Sunday night – Pirlo, Ugo Okoli, RJ Allen among them – will likely see the field at Rio Tinto against RSL on Wednesday night. Man of the Match: It’s extremely tough for me to choose between Maxime Chanot who once again showed why he’s the leader of the back line, and Alex Ring who has time and again proven that the central part of City’s end is his and his alone, but I have to give this one to Chanot because of a fourth yellow shown to Ring, who now stands one away from a mandatory suspension. In a short week, it puts both Ring and NYCFC on their back foot.